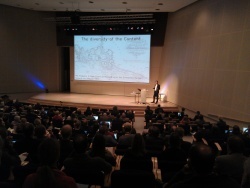 At the Europeana Network Annual General Meeting 2013 in Rotterdam, the Netherlands on 2 December 2013, Deputy Director Steven Stegers and Project Manager Judith Geerling represented Historiana and the History Education Pilot . In two sessions participants were challenged to think of ways in which to bridge the gap between cultural heritage institutions (Content Providers) and the creative industries, and ways in which the Europeana Network, of which they are all part, can stimulate the re-use of Europeana material for educational re-use. In the first session, Steven Stegers co-moderated the Education roundtable session ‘Faraway so Close – Bridging the gap between Cultural Heritage Institutions and Creative Industries’ together with Jiri Frank, the leader of the natural history education pilot in the EuropeanaCreative project. Some of the manifestations of this gap identified were the problems with identity (cultural heritage institutions do not see themselves as creative industries), licensing (cultural heritage institutions license their material in a way it is not allowed for re-use of the creative industries), attitude of cultural heritage institutions (unwillingness to freely share their material), and lack of knowledge of what it means to open up. Some solutions mentioned are making it clear to cultural heritage institutions that the creative industries want to use their material in a way that is also beneficial to the content providers (attract more people to the museum to see the material in real-life). Another case mentioned was the critical role of educators in the online availability of cultural heritage, and the example of the Library of Congress that has educators in residence was indicated as a best practice. The second session started with a brief overview of the current status of the History Education Pilot in the form of Historiana. The participants were challenged to discuss the added value of Europeana and discuss how the Europeana Network can stimulate the re-use of the available material on Europeana for educational means. Three groups each identified what they see as good ways to stimulate this re-use and came up with suggestions such as lobby for Europeana to be included in national curricula, enrichment of the data by tracking statistics of sources in Europeana to be able to see which sources are viewed most and enrichment of the data by cultural heritage institutions themselves.